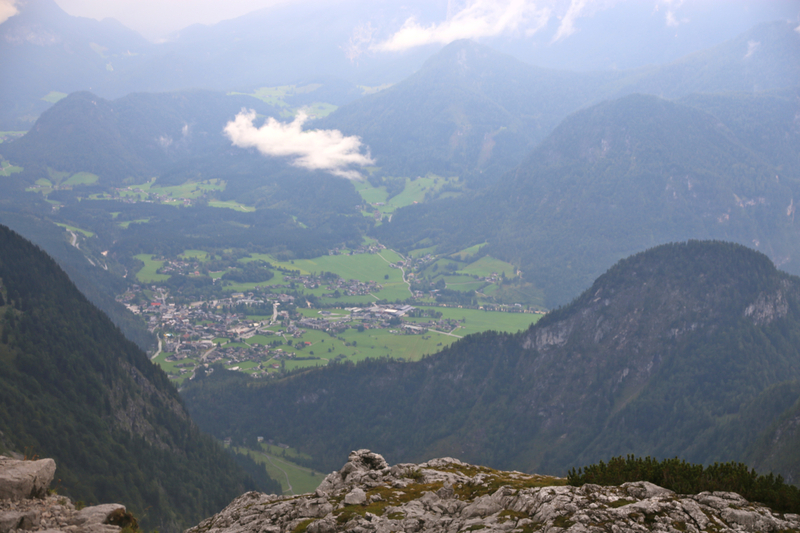 If you travel on the autobahn from Munich to Salzburg, then exit south towards Inzell shortly before Salzburg. 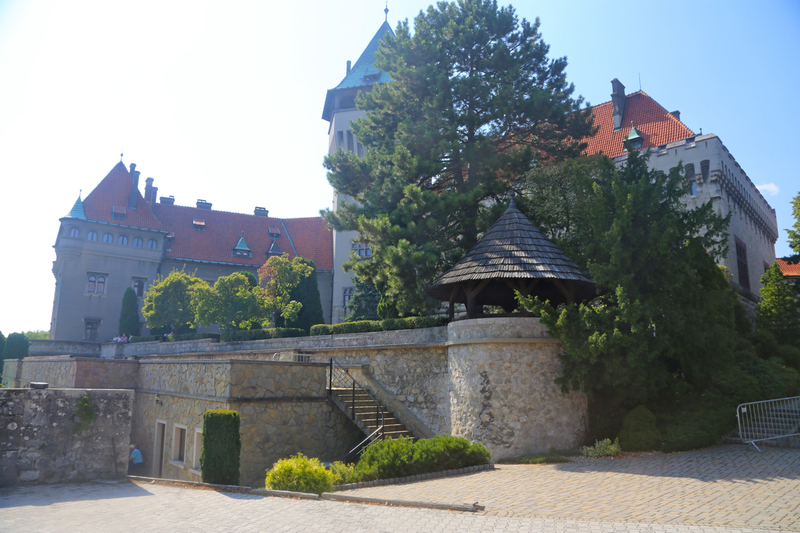 Drive through Inzell and continue south following signs for Lofer. You will enter Austria (on Hwy. 178), then pass through the small town of Unken. Continue on Hwy. 178, the next town is Lofer. Do not enter the centrum, but make a right in the traffic circle immediately after a Shell gas station. Drive a bit more than one kilometer from the traffic circle, watch carefully for the first (smaller) road that runs left. Turn onto this road. You will soon arrive at some signs telling you that it is illegal to drive any further. However, with smaller letters below on one of the signs, it says that visitors to the Von-Schmidt-Zabierow-Hütte are allowed to continue. Keep left at the fork in the valley, then continue a short way, slightly uphill, to the end of the road where there is a parking area. Park here, this location is N47.56366, E012.67222, elevation about 850 meter. Hut climb The Von-Schmidt-Zabierow-Hütte (phone: +43-6588-7284) is strongly recommended. The hut is managed by Katharina Filzer-Meiberger and her family plus some additional help on busy weekends. Katharina is very service-oriented and also very knowledgeable of the local mountains. She is also a good skier! From the parking/trailhead, take the very well made trail that heads uphill, first across some small pastures (cows) at the valley floor, then more uphill in zig-zag bends to your left. 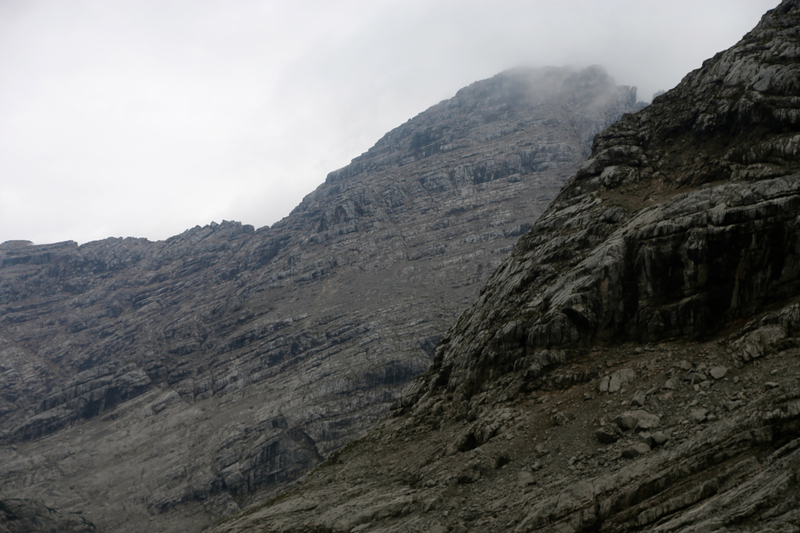 The trail gains a local shelf that is followed by a climb up a fairly distinct gully. Higher, the route continues its climb as it nears the main, steep valley. Higher up, you will finally see the hut, standing prominently on the top of a small, local top in the middle of the larger drainage. 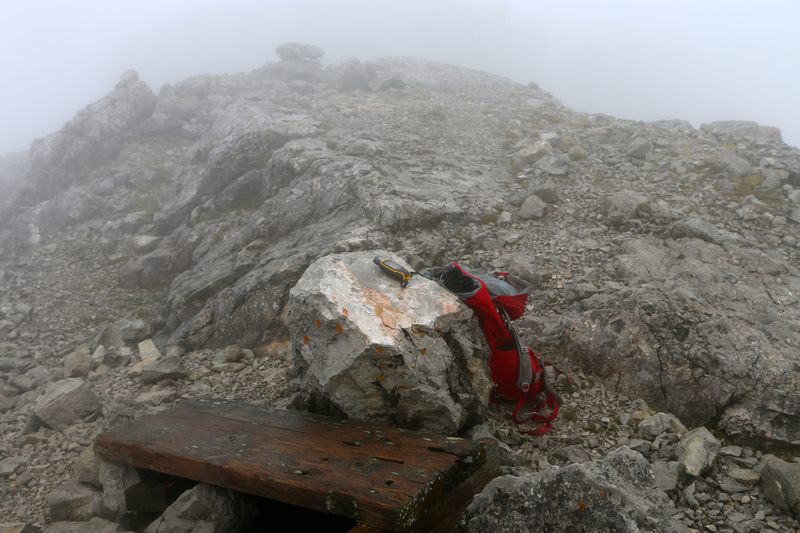 The last part of the climb is on limestone, you will reach a signed trailfork about 10 minutes below the hut. 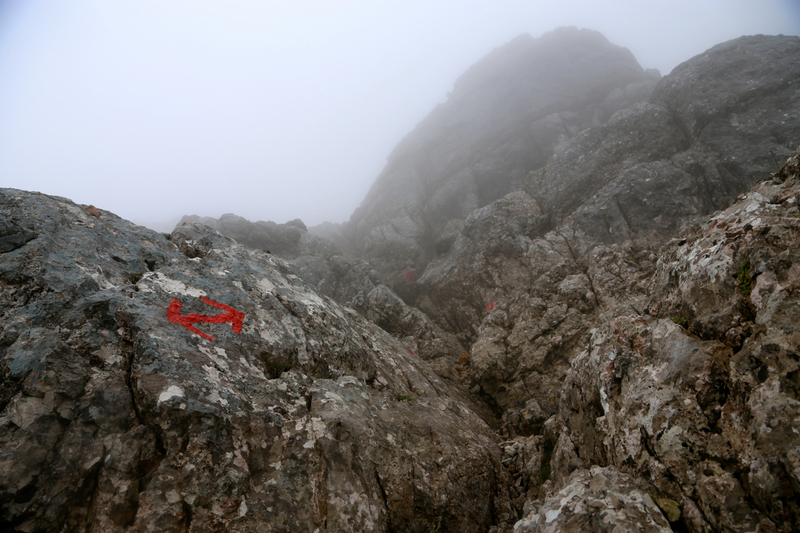 The final section is well marked with paint on the rock. From the hut, first retrace your steps to the signed trailfork. Continue straight where the trail from the valley descends left. 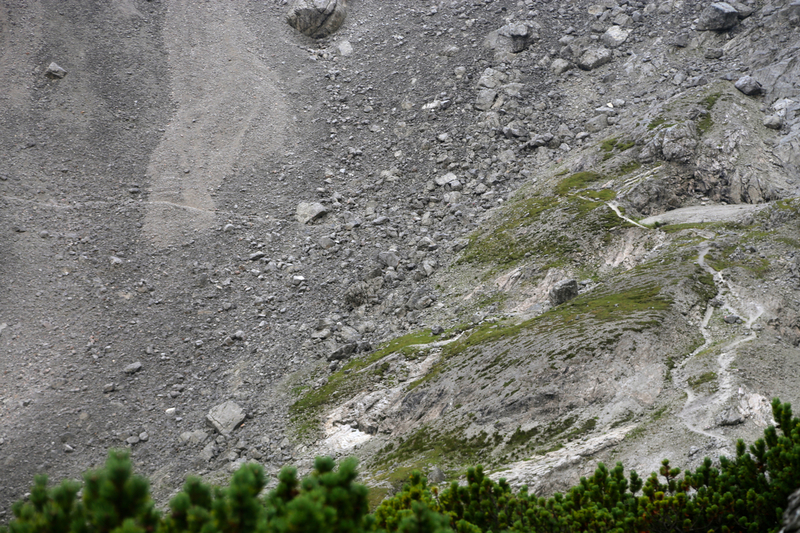 Shortly, there will be a second trailfork, here a trail climbs right while you should continue the traverse as the route passes the first mountain, Grosses Reifhorn, 2488m, on the north side. The trail curves a bit right as it descends into the upper section of the valley that lies between Reifhorn and Ochsenhorn (on the north side), then climbs up to the north base of the Grosses Ochsenhorn. There is a signed trailfork here. 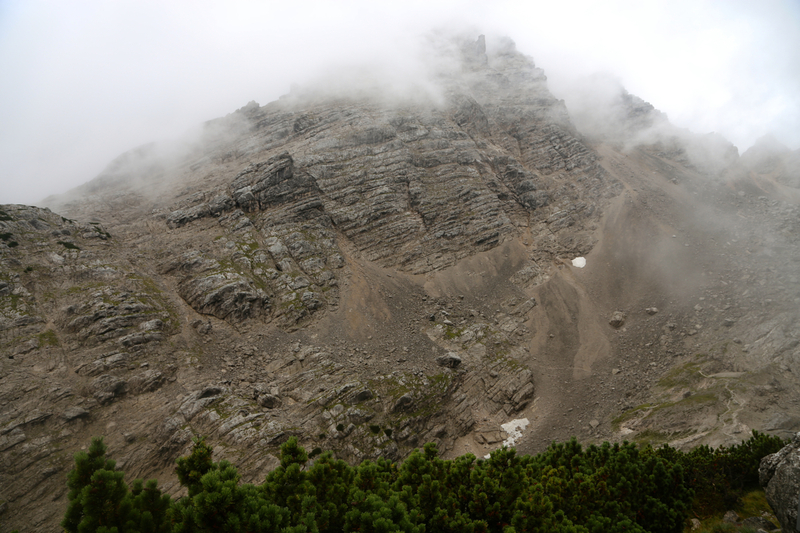 The route to the summit is called Schärdinger Steig and runs directly (right) uphill from this fork. First, zig-zag up an easy slope to a small, local col. 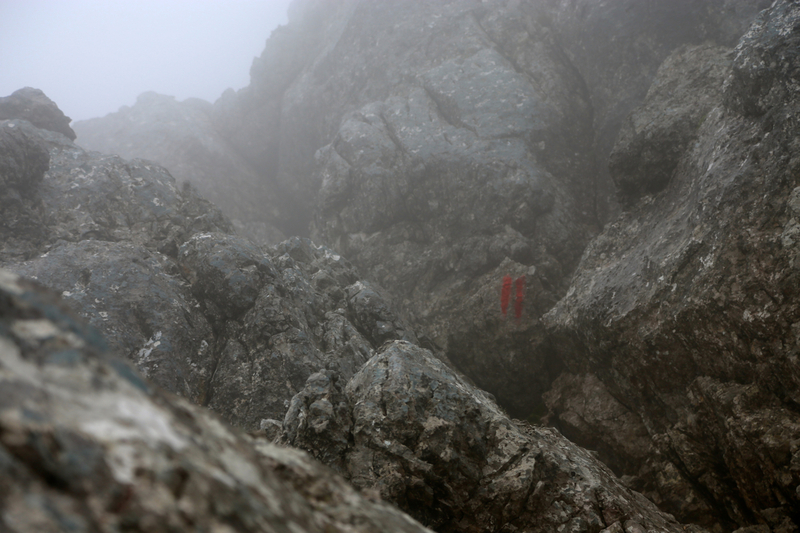 Here, at location N47.54213, E012.65904, elevation about 2115 meter, you encounter the first, easy (YDS class 3) climbing section. What remains is 400 vertical meter of (YDS) class 3 and class 2 terrain. The class 2 typically consists of broad ledges ascending to the climbers right, while the class 3 terrain connects between lower and higher ledges. There are two sections with quite a bit of (YDS) class 3 scrambling, the limestone rock has almost always lots of foot and hand-holds and often alternatives. Near the top, you turn a small corner and one must here traverse/descend into a distinct gully. This section is protected by about 10 meter of steel cable. Next, one ascends the top part of the gully followed by a short, but somewhat steepish final climb before the short summit ridge. This ridge has two humps and the summit cross is located on hump number 2. The humps are nearly equal in height, the first hump has a concrete marker and may actually be slightly higher. 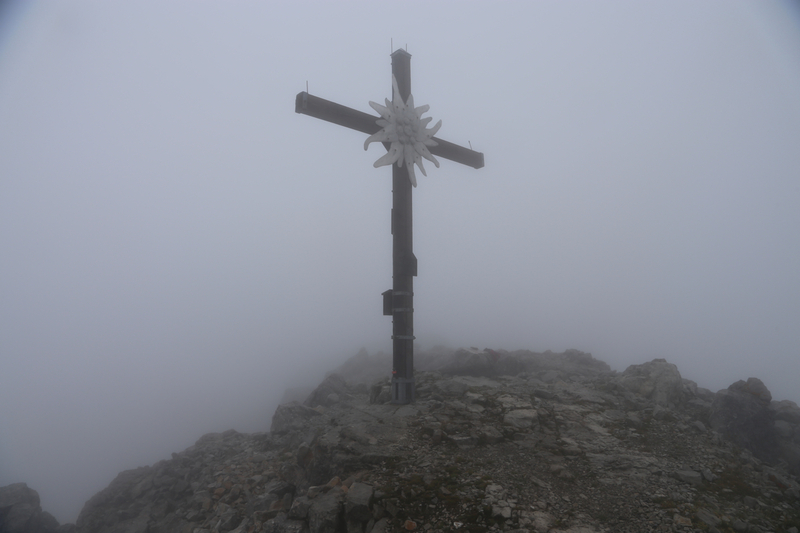 After getting soaking wet on Sonntagshorn in the morning, all that remained on this day was an 1100 meter vertical climb to the Von-Schmidt-Zabierow-Hütte. I was ready to go at 1300. Most of the wet cloths were in my backpack. I decided that since I surely would get rained on again, the best approach would be to wear minimal of cloths. Thus, I started out with shorts and a T-shirt, about all I had that were still dry. The sign said 3.5 hours, so I was quite pleased when arriving already at 1445. Katharina was the only staff, thus it did not take long before I had a large weissbeer and a bowl of hot soup. It turned out that I was the only guest staying overnight, on busy weekends (with better weather), Katharina told me that they could have as many as 80 guests. Dinner was served at 1900, I took the opportunity to put all my wet gear up for drying. We had a nice chat about mountains and skiing, before going to sleep. The forecast called for more bad weather, at least in the morning. We agreed that we could have a late and lazy breakfast. The wind died down, but the fog did not go away. I decided to give it a try at 1045. 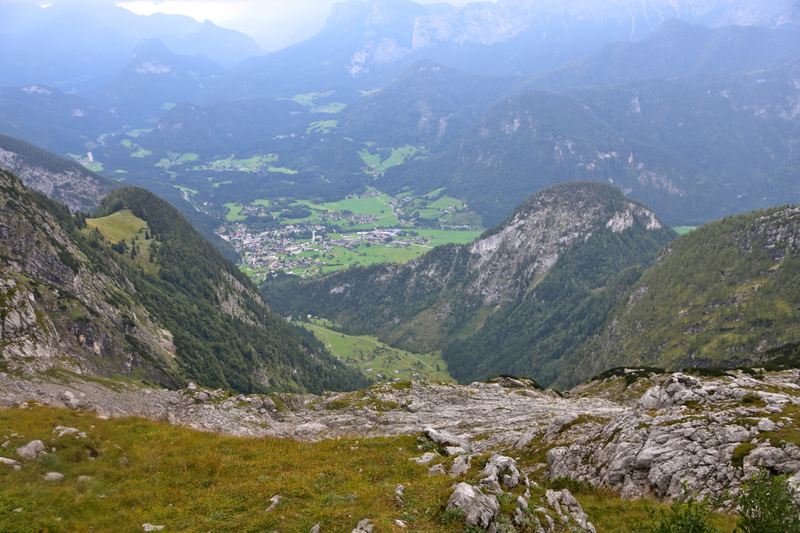 It took me one hour to walk across to the fork where the Schärdinger Steig begins. I got my first view of the mountain when descending into the last small valley directly under the west flank, when the fog partially broke up for a brief moment. It looked sort of uninviting, perhaps good that I did not know that my route would be directly up on this side. The ascent was interesting, always fun to look ahead and see what is waiting around the next rock/corner. This was more sustained scrambling that I would have guessed beforehand. The fog persisted so I could only see the next few meter ahead. In a few places, this meant not seeing the end of a scrambly section. Despite some wet rock in places, there were generally plenty of holds, one just needs to figure out what is the easier, safer way to do things. I got to the summit at 1245, so 2 hours from the hut. I stayed around for 15 minutes, but the fog showed no signs of leaving. The return trip bacame a true copy with respect to time, one hour down, then one more hour on the return hike. I stopped for yet another weissbeer (well earned!) at the hut, stayed around for 45 minutes. Katharina had received reinforcement, she would actually also head down this afternoon. Shortly after leaving, I met several parties on their way up, so more people would stay tonight. 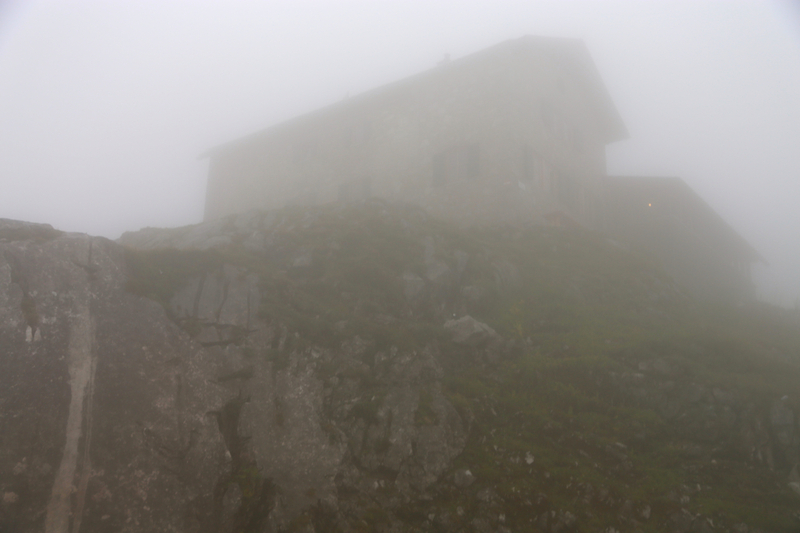 A young man had hiked up on a day trip, he caught up with me as I stopped to finally get a picture of the hut without fog. We then walked together back down to the parking in 1:35, so 10 minutes faster than my ascent. Overall, this was a very nice trip, despite somewhat miserable weather. The hut is a perfect place to stay and the ascent itself is quite a lot of fun. I returned to my B&B place in Unken, now ready for the conference in Slovakia. 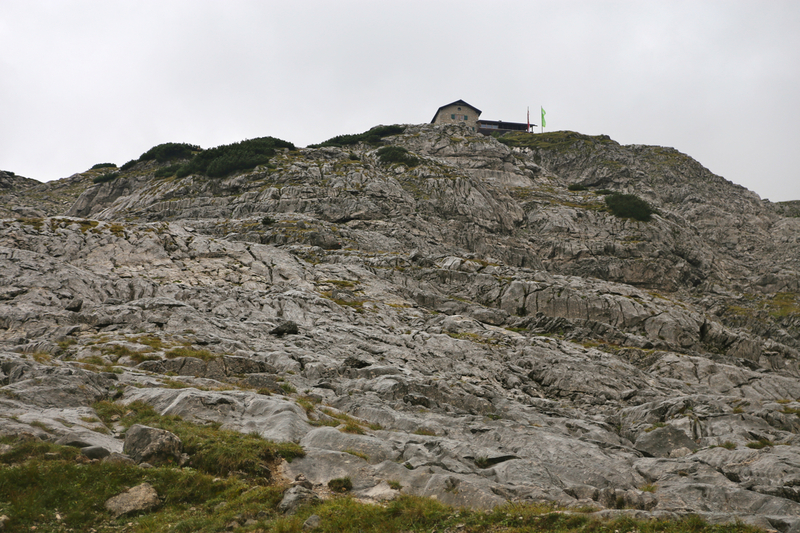 Next weekend I have again a reservation here for Saturday night, hoping to climb Hochgölling that day. Grosses Ochsenhorn as seen from the hut. Lofer and the trailhead area, as seen from the hut.